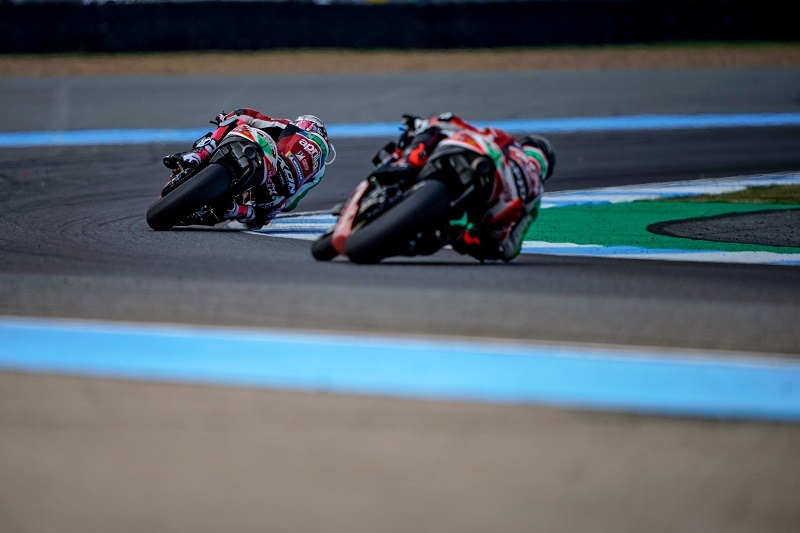 The final practice sessions on the Buriram circuit also had the riders and teams working on race settings, with particular attention on tyre wear which promises to be the critical element of the boiling hot Thai weekend. If, on one hand, the hardest compound seems to guarantee more consistency, the performance demonstrated by the soft tyre could allow a more sustained race pace. The final decisions will be taken in the warm up session tomorrow morning, where Aleix Espargaró will continue assessments, aiming to further improve his feeling with the RS-GP. The Italian bike demonstrated good form on the second part of the track, the more flowing section, whereas it leaves a few tenths behind on the initial section, made up of abrupt accelerations and long straights. Despite his sixteenth spot on the grid, Aleix showed a race pace that places him in the running for the top 10. For Scott Redding, the biggest difficulties arrived in qualifying. Rather consistent in his practice sessions, the British rider had problems braking when trying to increase his pace for the flying lap. This is a limitation that kept him from moving any farther forward than the eighth row on the starting grid.